Learn Redis The Hard Way (in Production) — How a popular hotel comparison site uses Redis heavily in production, including where things didn’t work as expected. Scuba: Diving into Data at Facebook [PDF] — A paper describing a commonly used system at Facebook for doing live, real-time analysis on terabytes of data. Related Hacker News discussion. 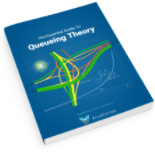 [eBook] The Essential Guide to Queuing Theory — Queueing theory rules everything around you - Whether you’re an entrepreneur, engineer, or manager, queueing theory is one of the best ways to boost performance. This 30-page ebook demystifies the subject without requiring pages full of equations. The Probability of Data Loss in Large Clusters — Many distributed storage systems (e.g. Cassandra, Riak, HDFS, MongoDB,) can use replication to make data durable, but how does this affect the odds of data loss? 1.1 Billion Taxi Rides on kdb+/q & 4 Xeon Phi CPUs — Q is a programming language with a built-in, column-oriented, in-memory and on-disk database called kdb+ that includes and extends SQL. Here’s a practical look at using it. The Internals of PostgreSQL — Suzuki Hironobu covers the internals of PostgreSQL for database administrators and system developers in this helpful translation of his 2012 Japanese-language book. MySQL and Snap Packaging — A look at using ‘snaps’ (a new way of packaging apps for distribution on Linux) to distribute MySQL. JanusGraph Picks Up Where TitanDB Left Off — JanusGraph is a new Linux Foundation project formed to continue development of the TitanDB graph database. InfluxDB 1.2 Released — ..with subqueries and 50% better write throughput on larger hardware. Providing Least Privileged Data Access in MongoDB — Read-only views (ROV) are a similar concept to table views found in relational databases. Secure MongoDB and Protect Yourself from the Ransom Hack — Advice on how to protect yourself from MongoDB ransomware. Running Production PostgreSQL Systems on ARM Architecture — A whitepaper exploring if PostgreSQL on ARM is a viable option for your next project. Designing the UFC Moneyball using multiple databases — Gigi Sayfan from VRVIU shows us how analytics for sports can be done using Cassandra/Scylla, MySQL, and Redis. HikariCP: A Solid High-performance JDBC Connection Pool — Can support 10,000 simultaneous users.